FQB "Ooh La La" Collection is a cottage chic digital kit that will whisk you away to the City of Love!! Stroll through the display and let the sights of the Eiffel Tower, hot air balloon, beautiful flowers and lace hearts guide you towards a lovely creation that is coming from your heart! 1 Hot air balloon to dress up your creations and take your mind away! 3 Borders of ribbon with lace attached...what can be more shabby style than this? 5 Brads with richly coloured centres in the colours of this kit...add some bling...it will defintely work! 3 Butterflies with wings of beauty. Three different designs and colours will easily match the tones of your crafting creation. 3 Eiffel Towers...now we know there's only one iconic structure, but to have it in different colours is truly creative...don't you think? 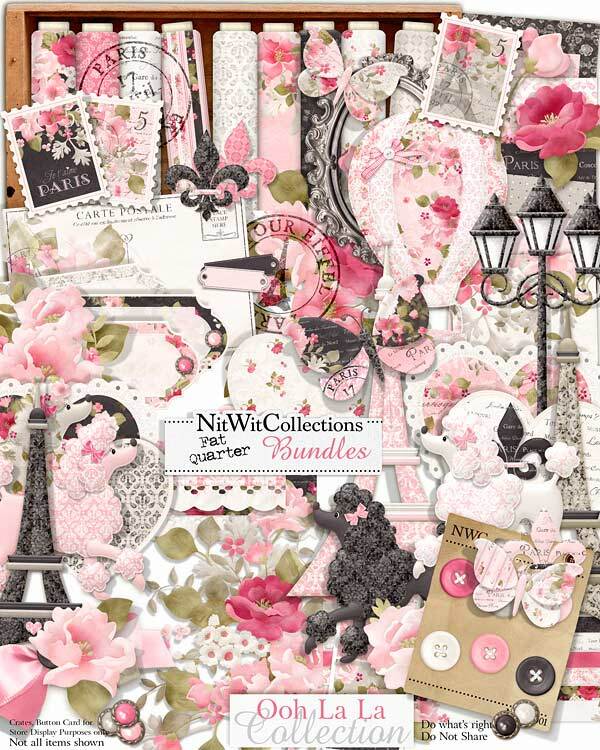 4 Fleur de Lis digital elements that are quintessential for this kit's feel and theme?! 1 Flower in a rich pink tone to add flair and contrast to your layouts, cards and more! 1 Flower shying away from us with it's view....maybe it's a "Timidos" variety?! 1 Flower cluster with the addition of some smaller accent flowers too! 2 Hearts with lace borders...don't they just exude prettiness?! 4 Poodles with their heads held high...such poise! Which is your favourite? 1 Post card complete with stamp area and enhanced with the lightly coloured flowers. This could make a beautiful card on it's own! 1 Post mark stamp - "La Tour Eiffel, Paris"
1 Post mark stamp - "Paris France"
2 Word strips that are blank...we know you must have lots to say and you can say it best!